Elliotts Wakatac Proban Range has been designed and constructed to provide the highest possible levels welding protection in a lightweight Proban Cotton Shell. Wakatac Proban is a 100% Proban Treated Cotton. PROBAN® is a chemically treated Cotton fabric designed to protect the wearer from a range of workplace hazards such as arc flash, flash fire, molten ferrous metal splash, exposure to welding and wildland firefighting. PROBAN® used in Elliotts Safety Apparel meets certification NFPA 70E, AS/NZS 4824-2006 and compliance to AS/NZS 4824; ISO 14116 Index 3, ISO 11611 Para 6.7, ISO 11612 Para 6.3 after 50 wash dry cycles according ISO 15797 Procedure 8. When exposed to flame, PROBAN® fabrics form an insulating char, this stays in place and helps protect the wearer. PROBAN® fabrics do not smoulder, have no afterglow, do not melt and the flame doesn't spread outside the charred area. 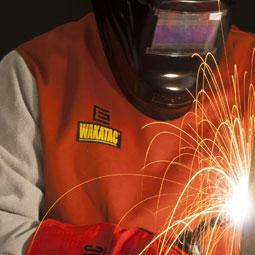 WAKATAC Proban High Vis Welding Jacket, Leather Sleeves, Safety Harness access.